Posted January 30th, 2019 by Mobile Music School & filed under Educational - How to Guides. Our workshops for schools are full of fun and experimentation! 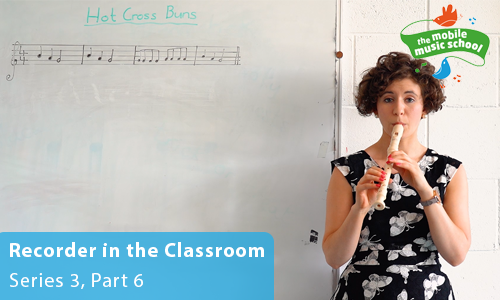 Let’s experiment with ‘Hot Cross Buns’ this week by mixing up the volume and speed of the piece. Put your own spin on it and have fun! Taking what we’ve learned about notes B, A and G, clap, sing, play and ‘Hot Cross Buns’ let’s mix it up a bit! Try changing the volume when you play, first playing really quietly. Now try playing the piece loudly, but be mindful not to play so loud that your recorder squeaks. Let’s try experimenting with the speed now, going from really slowly to as fast as you can! We would love the opportunity to come and share our passion for primary school music with even more students this year. Please get in touch with us today to discuss our workshops for schools, or to arrange for us to drop out.